Not too long ago we were amazed by the CX-10C, a CX-10 size quadcopter with a camera. Even though only 0.3MP, the images were quite smooth, and it was an amazing feat at that time. However, once the novely wore off, drawbacks become more and more apparent. Slow yaw rate, short flight times, and the video quality was no match for the cameras found in multirotors that were just a little bigger. 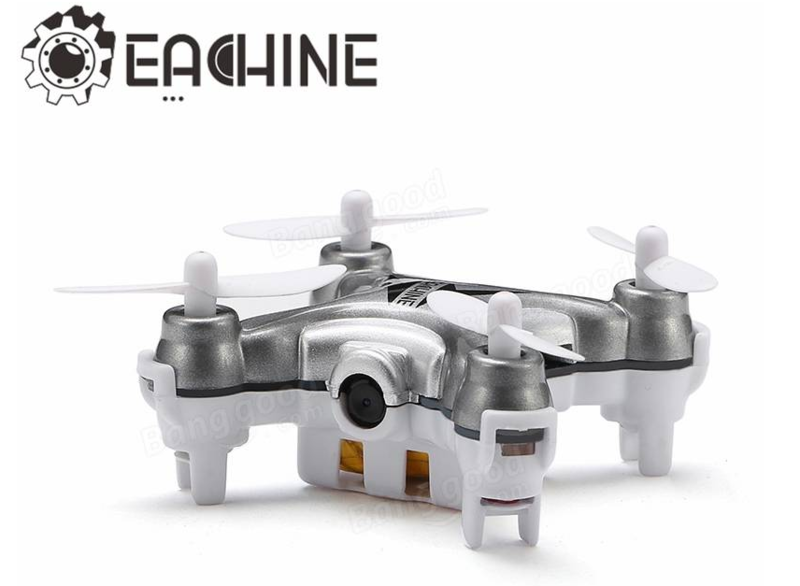 This Eachine E10C promises to be new step in the right direction, with better resolution camera, more agile flight, and longer battery duration. Can it live up to the claimed specs, or will it be more of the same? Disclaimer: I don't get paid, or in any other way make money with reviews like these. Product specifications and quality may vary at the manufacturer's discretion, and are beyond my influence. I cannot guarantuee you will get a product that performs exactly the same as seen and described in this review. There is always room for a general discussion on the reviewed item, but no affiliate links! No SD card for the camera and/or card- reader. So if you want to shoot pictures and video, you need to source these from somewhere. The E10C weighs 16.76 grams, on my tiny scale. As the quad looks a lot like the CX-10C, it's no surprise it uses the same charge connector, except with reverse polarity, so like the 8801 LuLa and Helicute Nano 2.0. The transmitter has surprisingly few buttons. Cycling rates requires pressing down on the left stick, and pressing down own the right stick activates flip-mode. The shoulder buttons control taking a picture or video. Calibrating the gyro is dome by holding both stick bottom left position. Arming sequence is quad on, then transmitter, throttle up and down, and ready to go. In the air one thing becomes apparent very soon. the E10C has much better yaw rate than the Cheerson. In mediun rate it's already quite lively on yaw, on highest rates, it spins like a top. So what the CX-10C lacks in yaw, the EC10 overshoots the ideal yaw speed by far. Pitch and Roll in medium rates are not that great, but the yaw speed is nice. It would have been nice if the pitch and roll of the highest rates would already have been available on the medium setting, And that highest rate would only increase the yaw. So back to medium rates for now, since it has the best yaw setting. Control feel is a little indirect, not laggy, but more like JJ1000 vs 3015-2. Flips are not that good, the quad seems to suffer from VRS and even when starting the flip at 2 metres above the ground, it becomes a "touch-and-go" , as even full throttle can not prevent it touching the ground briefly. Maybe the battery needs to get worked in, for better recovery after a flip.. The leds are very bright, including the one showing camera status. Would make a great night flyer, no doubt. The E10C certainly tries to surpass the CX-10C. With higher resolution images and video, and much faster yaw, it looks like it's a clear winner. But things are not that clear cut. The yaw is already fast on medium rates, and becomes pretty much useless on highest rates, while only on that rate, the pitch and roll are ok, and too slow on lower rates. Flips are hardly possible, as the quad drops down far, due to VRS, after making the flip. The camera does output at the claimed resolution, but the images are not crisp, and as soon as the E10C starts moving, there is much blurring. So while in theory the E10C should give better video, the smooth low res output of the CX-10C is easier to look at. Maybe my E10C is not fully ok, the bad flip performance could be an indication. So maybe it's not a total loss, but based upon my experience so far, I would prefer the CX-10C for now. - Camera has some trouble with fast yawing. Last edited by SoloProFan; Apr 17, 2016 at 03:29 AM. One of the things that will interest many people, is the camera on the E10C better than the one of the CX10 series? Well, pictures are shot in 1920 x 1080, which sounds impressive. However I am not certain if that is native resolution, or interpolated. The camera needs good light, when flying indoor, images tend to show a fair amount of noise, so you can see the small camera is struggling. Same applies to the video, this time the resolution is 1280 x 720, but when I compare for instance to footage of the FW777-957 "Gazer", which also makes 720 videos, the E10C's camera has less definition, as well as colors being more washed out, and having more probems with fast yaw movements, video becomes a blur. If I compare against another camera that records in this resolution, the one of the WL Toys Q242G, the difference is even bigger. Not just details, but also there is much more motion blur, even when not making a fast turn. So it does offer a better resolution than the CX-10C, but lacks somewhat in smoothness. Last edited by SoloProFan; Apr 17, 2016 at 03:32 AM. Cannot wait on the results out of the camera; the CX10C was quite a surprise in that field. It's clear that Eachine has kept a "close eye" on the CX-10C. The body is so close in shape, that it looks like they made a clay mold of the Cheerson. Update with pros and cons, and some comment on video and image quality. Maybe you got a lemon? pretty sure the E10C and the CX-10C are made in the same factory. Could be, considering the poor flipping performance. I doubt it. The models look very similar but parts are not 100% identical. It feels more like a copy, than a rebrand. I've ordered one as I do like these small camera quads. Will see what it is like. At first I thought this was a rebrand of the cx10c. But there are obvious differences in the TX and quad itself. As well as differences in flight characteristics. I was interested if it truly had a 720p 2mp camera. You seem to indicate it does but at the same time does not perform as well as the 0.3mp camera in the cx10c. Same weight as the CX 10C and CX 10W? I found flying the CX 10W with a Tx it would just drop to the floor on flips and struggle to regain height. It always felt way too heavy for the motors and props. I didn't think the video was bad at all considering the size of this quad and after the CX-10W which was just un flyable with any sort of precision, the little TX is so welcome. Interesting what you say about the limited rates though SoloPro, I found them to be higher than my first edition CX-10 although that still slight trumps this E10C in terms of flying precision even with a smaller TX still. I do wish they would/could make a quad that didn't have trim that drifted in flight as these little guys have so much drift that it starts with a perfect hover and by the end full forward isn't enough to stop it drifting backwards. I'd rather that and rate mode were used over all stupid auto flips and HH modes and other useless 'features'. I do seem to have a quad with the occasional funks though, twice in this video before the cat comes to play the quad dives off to the side way faster than if you just jammed the sticks and loses height. Watching it back after made me think maybe props were slipping so will try tacking them on with CA but has anyone else had this?